Written and directed by Georg Maas. DOP: Matl Findel and Georg Maas. Produced by Zinnober Film, 100 min, 1998. 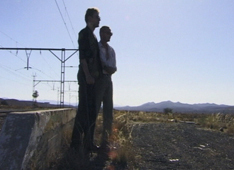 What starts off as a trip by two globetrotters in South Africa soon turns into a story of love, death and incredible events.”Pathfinders” is a documentary road movie, a vivid journey through distant and inner landscapes: the confrontation of two people, who made their plans during the 70s, with fate. The film was shot in South Africa, Bali, Australia and Germany.